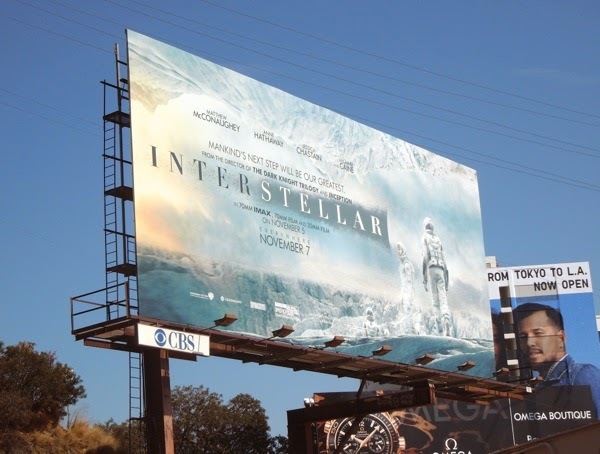 "Don't get too excited, don't get too excited". 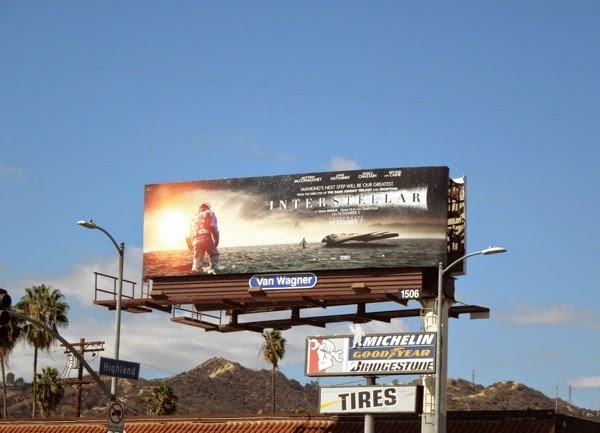 That's what Daily Billboard keeps telling ourselves in anticipation of Christopher Nolan's big screen science-fiction odyssey, Interstellar. 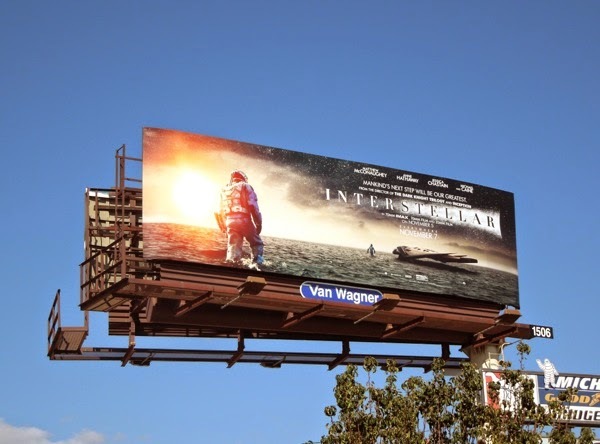 In the past with films like Inception and the finale of The Dark Knight Trilogy, the intrigue and expectation was so high for the finished films to be masterpieces that the end result just fell short. 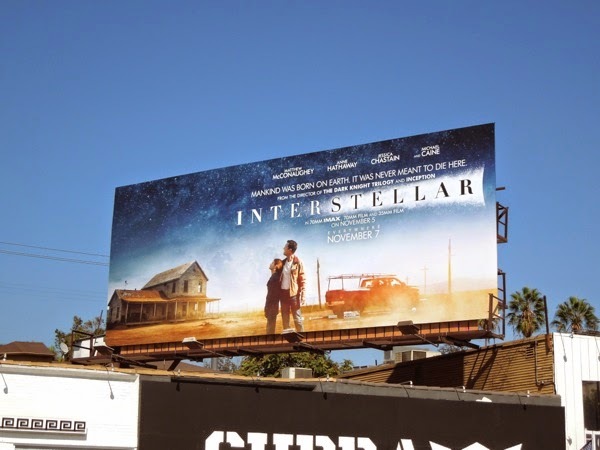 The film has such an unapologetic high sci-fi premise, the Earth is dying and so mankind must send a desperate mission to the stars to find other habitable planets and resources. 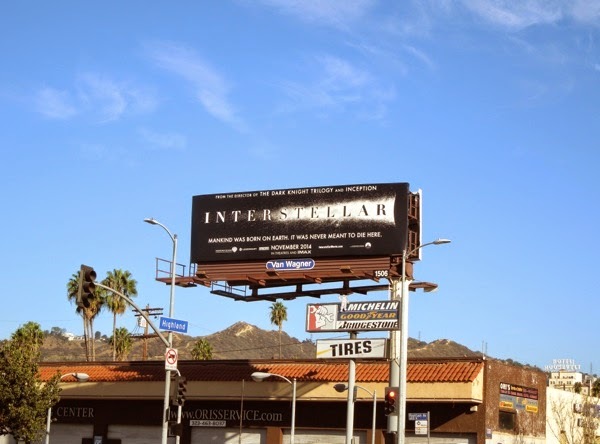 Add in an Oscar-winning actor on top of his game, Matthew McConaughey, who has to leave his family behind in order to embark on an interstellar journey to save the whole of humanity. 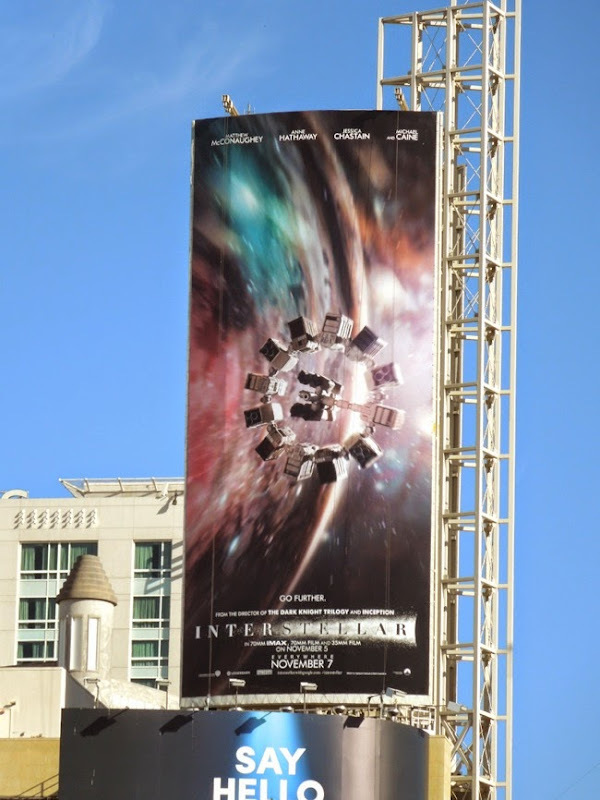 Plus pair him with another Academy Award recipient in the form of Anne Hathaway as another astronaut explorer taking advantage of newly discovered wormhole technology, and you can see why excitement is high for this spacebound endeavour. 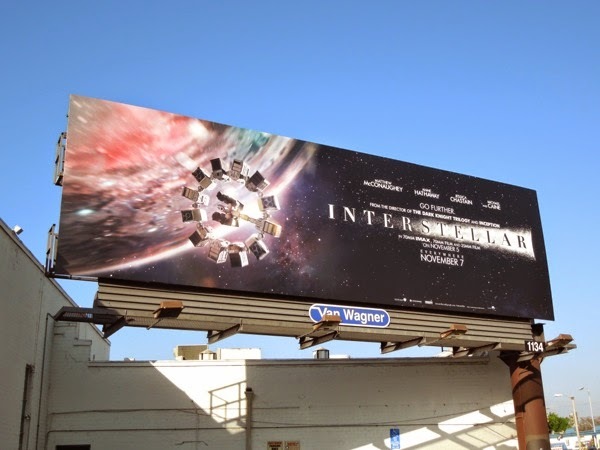 These billboards for Interstellar hint at the grand scope of the movie and really capture your imagination, from the intriguing water and ice planets to explore, cool spaceship designs and even an Earthbound creative which hints at the humanity and family at stake and the adventure beyond the stars. 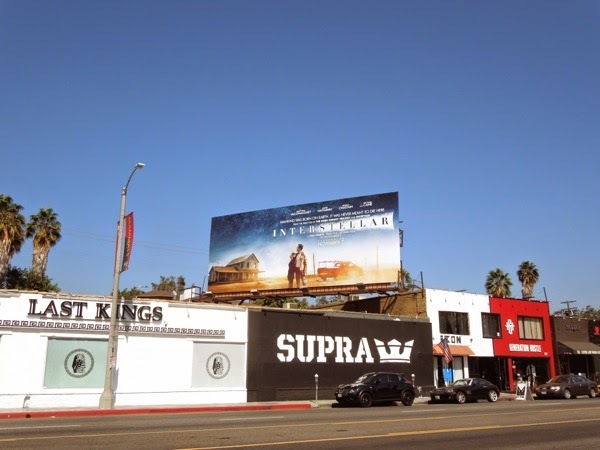 The teaser billboard with just the film title was first spied along Venice Boulevard on September 29, then later along Highland Avenue on October 5. 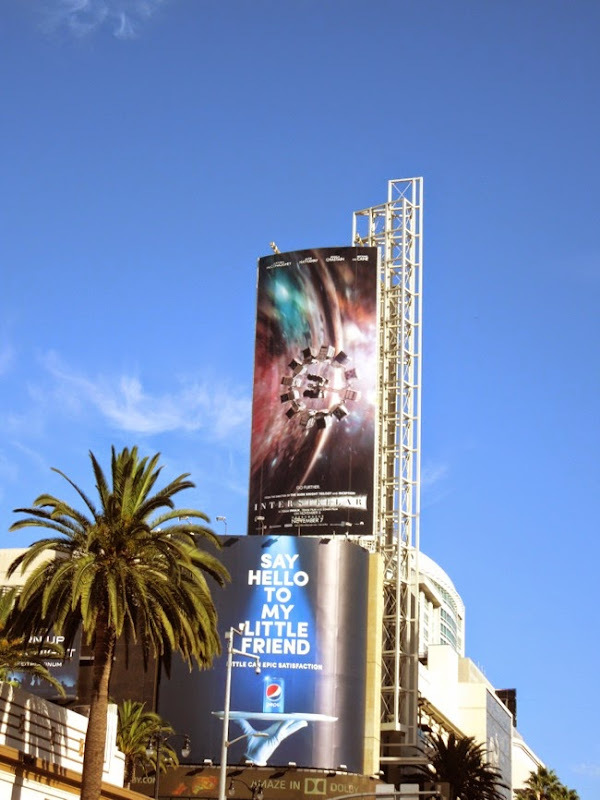 The 'ice planet' creative was snapped along L.A.'s Sunset Strip on October 8, whilst the portrait spaceship version was spotted high over Hollywood & Highland and a landscape version along Beverly Boulevard, plus the 'water planet' creatives were spied along Highland Avenue and Santa Monica Boulevard from October 5 to October 16, 2014. 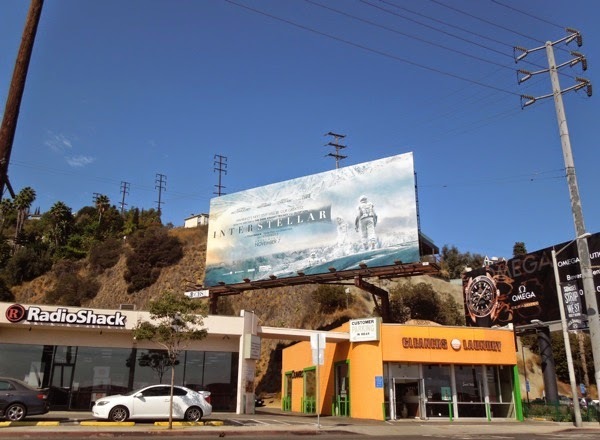 If you're a fan of the visionary director Christopher Nolan, be sure to also check out these cool billboards for The Dark Knight Rises and these Inception movie billboards. 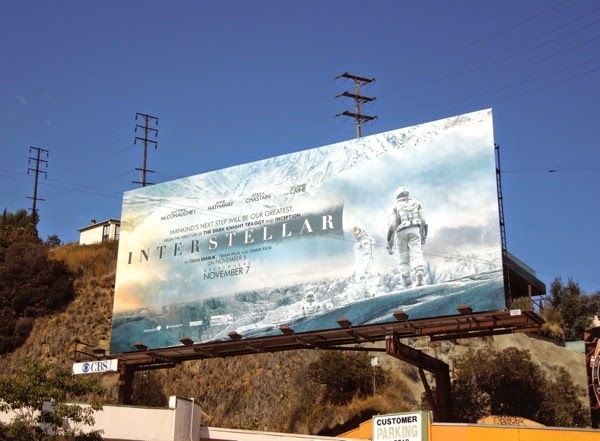 Please movie gods wherever you may reside in the cosmos, let this be an out-of-this-world experience that blows our minds and socks off. 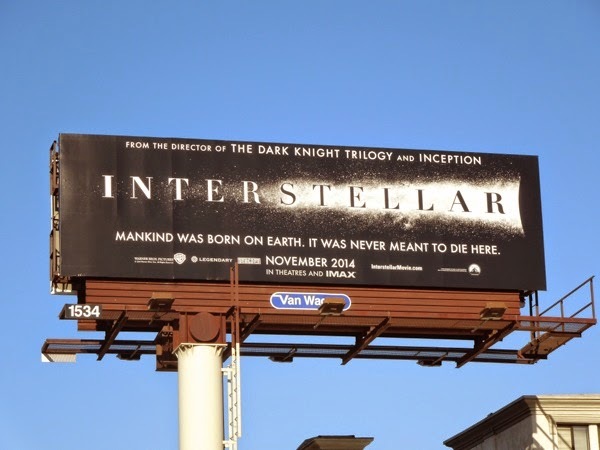 UPDATED: Interstellar wasn't flawless, but it was a great slice of sci-fi. 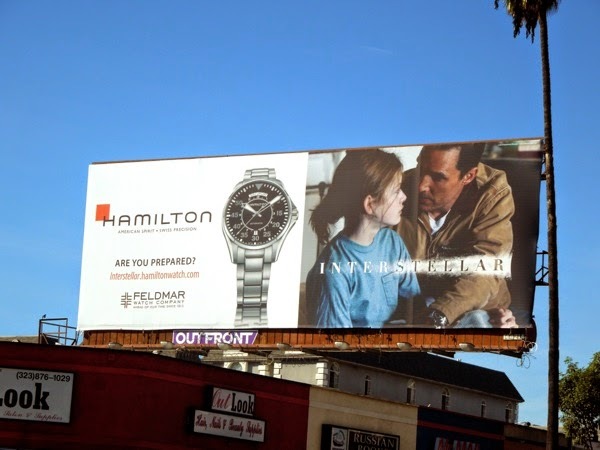 One of the plot devices in the movie is a Hamilton watch, and here's a product placement tie-in billboard for the Swiss timepiece brand showing Matthew McConaughey and his onscreen daughter along Sunset Boulevard on November 17, 2014. 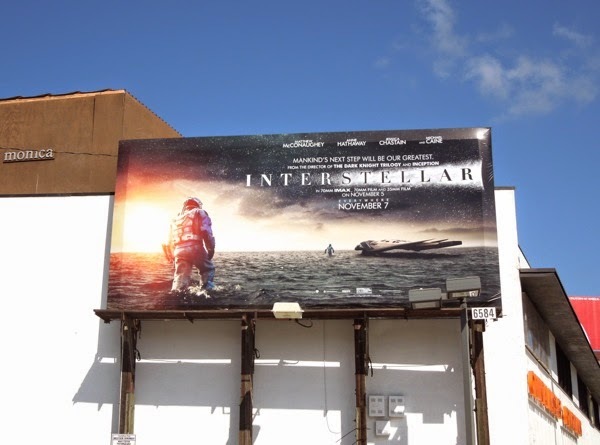 Plus if you're a fan of the movie, be sure to also check out Anne Hathaway's NASA spacesuit and props from Interstellar on display. 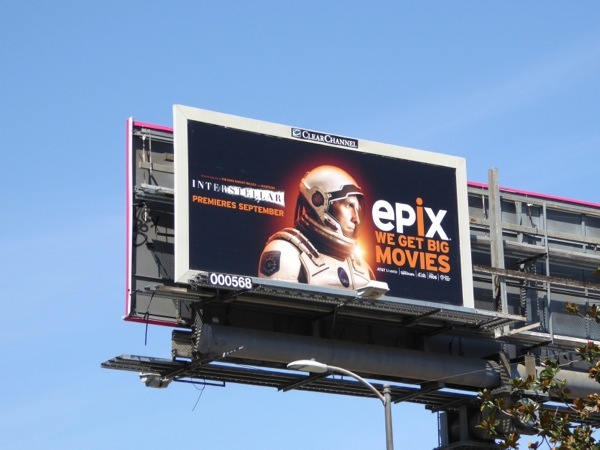 UPDATED: Here's also a billboard with Matthew McConaughey in his NASA spacesuit for the movie's release on Epix, snapped along Highland Avenue on August 28, 2015.